According to a new YouGov research study, commissioned by Environmental Business Products, UK Consumers Are Wasting a Combined £440m Buying Branded Printer Cartridges. These findings are significant. Each UK household could save on average £43.65 a year by switching to private-label products (private label products include compatible and remanufactured printer cartridges such as those sold by 123 Refills into the UK), and yet only 18% of households buy private-label (aftermarket compatible or remanufactured cartridges). The study was based on an estimated savings of only 25-25% compared to original brand cartridges, but retailers like 123 Refills save their customers even more (around 50% on average), so the savings are even more dramatic. Compatible toner cartridges for the Brother TN110 / TN115 and Brother TN210 toners are now available. All compatible cartridges to brother toner cartridges are listed here, and are typically 30-60% off the prices you would pay at an office supply store for original brand Brother laser toners. Customers enjoy a 2,200 page yield for the compatible TN210 black and 1400 pages for Brother TN110 compatible cartridges. For the TN115, remember that these are the high capacity equivalents to the Brother TN110. You can expect a page yield of 5,000 pages for the TN115 black compatibles and 4,000 pages for the Brother TN115 color cartridges (compatibles). Compare to 2,500 pages for TN110 black and 1,500 pages for TN110 color. This resulted in users of these printers being forced to change the cartridges, even when their existing cartridges still had some toner left in them. HP was sued for damages and an end to “deceptive and unconscionable practices” and has now come to a settlement. According to HP: "The Proposed Settlement provides for a number of benefits, including HP’s agreement to post on its website a description of the operation of the Affected Models as it pertains to any interruption or termination of printing caused by toner level in their print cartridges, including a description of the mechanism in certain printers that allows users to “override” any termination in printing caused by the level of toner in their print cartridges. This description can now be found at the following site. HP also will contribute up to $5,000,000 in e-credits to be distributed to class members who purchased, leased, received as a gift or otherwise acquired in the United States a printer on the Affected Models list"
Uni-Kit is in development stages for a resetter to reset the chips on the Canon PGI-225 and CLI-226 (Canon PGI225 / CLI226 printer ink cartridges). The resetter is being developed to serve end-user refiller needs and the small remanufacturer. Previous Uni-Kit resetters have been perfect solutions for these customer types, as they are low cost (typically under $20 at resale) and work unlimited times to reset the Canon chips. These cartridges are used in printers such as the PIXMA MG5220 Wireless Inkjet All-In-One, PIXMA iP4820, PIXMA MG5220, PIXMA MG6120, PIXMA MG8120 and other Canon inkjet printers. The Canon resetter for PGI225 / CLI226 is being developed by Uni-Kit to work in all the Canon PGI 225 / CLI226 cartridge series and to be accepted in all the Canon inkjet printers that accept these cartridges. 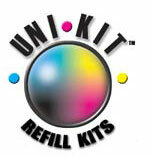 Update: The Uni-Kit resetter (Canon CLI226 resetter) has been released as of June 2011 and is available for purchase through 123refills.net. 123 Refills is first to market with a toner refill solution for the new Brother TN-420 and TN-450 toner cartridges. The Uni-Kit enhanced formula #7 has been qualified to work with these new Brother toner cartridges. The TN420 is the standard capacity and the TN450 is the high capacity version, both of which are compatible with the Uni-Kit enhanced #7 formula which is sold by 123 Refills for $29.99 per refill kit (enough for up to 2 refills). Refilling these Brother toner cartridges is easy, follow the toner refill instructions which can be downloaded at the Uni-Kit website. Since the TN420 and TN450 are new models, you can follow the instructions for the Brother TN350 for now since they are similar. Note that the starter cartridges (those that first come with the Brother printers when you first purchase the printer) require a reset gear (which is a small accessory sold separately, but not yet available. When available, it will be listed at the 123refills.net website. The non-starter cartridges do not need this accessory, so can be easily and quickly refilled with the Uni-Kit toner refill kit #7 (enhanced formula). The printers that accept the Brother TN-420 toner cartridge and Brother TN-450 toner cartridge include the Brother Laser HL-2240 printer series and HL-2270 printer series. The TN420 cartridges have a page yield of 1200 pages, whereas the TN450 have a page yield of 2600 pages. 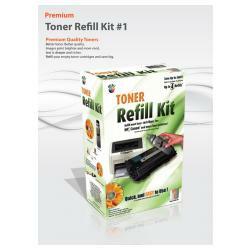 The Uni-Kit Toner Refill Kit #7 comes with enough toner to refill these cartridges at least 2 times, saving you over 75% compared to buying OEM toner cartridges. These Brother printers are becoming popular, with printer prices around $70 on the Brother® HL-2240 Mono Laser Printer (current pricing from Staples), and $100 on the Brother® HL-2270DW Mono Laser Printer (per current Staples offers). Eight years ago, Lexmark sued Static Control over patent infringement and inducement of patent infringement, predicated on Lexmark's employment of single-use restrictions on their prebate toner cartridges. Lexmark used their prebate program to sell their toner cartridges for an upfront discount (hence the term 'prebate'), on "condition" that the end-user returns the empty back to Lexmark (in effect, telling the customer that they don't own the cartridge they're buying, they only own the right to use the toner powder inside it). So basically, Lexmark would offer the cartridge at a much lower cost upfront, and then turned around and sued or threaten to sue companies that would attempt to remanufacture an empty toner cartridge that was sold to a consumer under the Lexmark prebate program (or in the case of Static Control, a company that supplied chips / parts that were used in the process of remanufacturing Lexmark toner cartridges). That was eight years ago, and the courts ruled out of Lexmark's favor in April 2009. Prebate was declared invalid. But Lexmark sought a retrial, and the United States District Court ruled on 28 October 2010 that the motion for a retrial would be denied, in effect rendering the Lexmark prebate program invalid - again. There are many components to remanufacturing a toner cartridge. The empty shell (or empty core as it is referred to in industry terms) is of course a key component. The core needs to be filled with toner, and moving parts inside the cartridge also need to be replaced. These include parts such as toner wiper blades, doctor blades, OPC drums (photosensitive drums), magnetic rollers, and other parts that make a toner cartridge function). These parts are either refurbished / reused from the OEM parts, or new compatible parts are placed in lieu of the OEM parts. 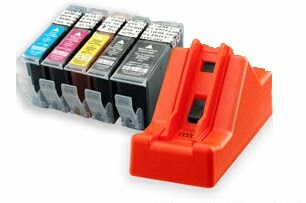 Some cartridges also have memory devices or chips, which often need to be replaced so that the printer can recognize the refilled toner cartridge as "full" and accept it in the machine. Kodak has been aggressively marketing its series of ink savings ads, making such claims on UK TV and print media advertising that 'customers can save 75 pounds a year on ink'. The ads were pulled after HP (hewlett packard) vigorously contested Kodak's claims and got the UK's avertising watchdog - Advertising Standards Authority (ASA) to agree with HP and force Kodak to pull the ads. Kodak inks are cheaper for users compared to original HP inks, that is a point that most industry experts would agree on, but they are still significantly more expensive than compatible or after-market inks. 123 Refills for example sells ink cartridges for use in Kodak printers that offer consumers around 50% savings compared to buying Kodak original printer ink cartridges. Compatible inks for use in Kodak inkjet printers are available through the website's Kodak ink page. This was in response to failed bomb attempts using modified toner cartridges for 2 parcels that originated in Yemen and Dubai. The UK is the only country so far to place restrictions on the transport of toner cartridges. This may give a local boost to UK based toner cartridge manufacturers allowing them to regain some market share within the UK, which like most western markets has seen significant growth in printer consumable (inkjet and laser toner cartridge) consumption that has benefited eastern manufacturing countries that export lower cost cartridges. It will hurt exports of toner cartridges from the UK in the short term. But safety comes first. Some news media outlets have reported that the toner cartridge could have been from Brother, HP or other manufacturers. Foxnews for example, ran a report in which they interviewed an executive of Clover Technologies Group, a toner cartridge remanufacturing company, who was quoted in the report as saying that the cartridge "looked like a model originally made by Brother or HP." The same report went on to say that representatives from the major printer manufacturers -- including Hewlett Packard, Canon, and Epson -- had so far declined to speculate on the device. Although not many photos have been provided in the media, the photo below which was posted at Hannity.com, suggests that it is most likely not a Brother brand toner cartridge, but most likely an HP or Canon monochrome laser toner cartridge (Canon also makes the engines for most of HP's toner cartridges, so the distinction between the two is often subtle). The reason why Brother is ruled out as a likely candidate is because the cartridge in the photo clearly shows an OPC drum, which is not found on Brother monochrome toner cartridges (and the cartridge appears to be for a monochrome printer). Brother puts their drums (OPC drums) onto separate cartridge units that they call "drum cartridges". In the case of HP and Canon however, the drum is part of the main cartridge on monochrome models, and so this photo is highly suggestive that the cartridge used was an HP or Canon equivalent (at least based on the limited photo presented by CBS below). It is also difficult to tell if this is an original brand cartridge, or an aftermarket (remanufactured / compatible toner cartridge) based on this photo alone.